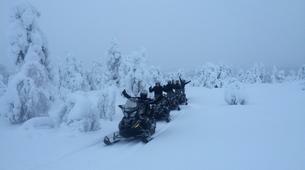 Welcome to this snowmobile expedition to the most extreme and exciting nature area of the European continent. Stay overnight at “Adventure Camp Mehamn”, comfortable fisherman’s cottages on the seawater! 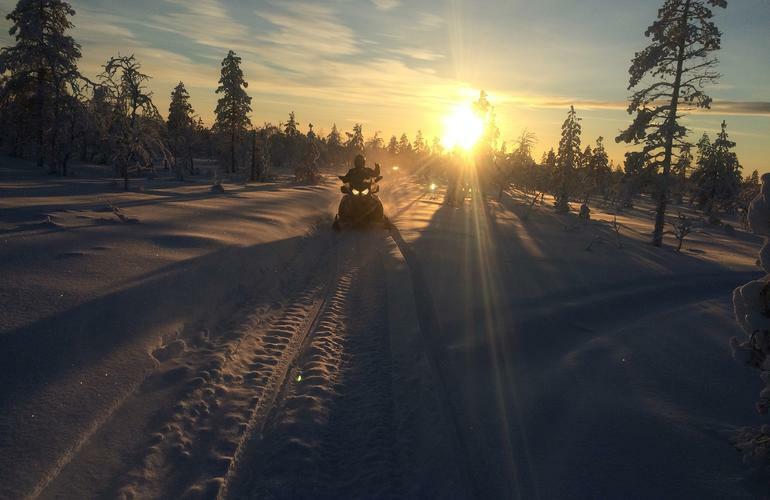 Come and explore snowmobile trails that cross breathtaking panoramas beyond anything you can ever imagine. All these exciting adventures are presented and guided by Vidar 'the Viking', a local Norwegian guide living at Mehamn, the northernmost fishing village of the world. The Adventure Camp in Mehamn is located on the Holmen peninsula and consists of 5 fishermen huts, a hostel with 16 beds, 18 separate parking places for camping cars, a small boat marina, reception, service room for camping car visitors and hostel/lodge with 16 beds. 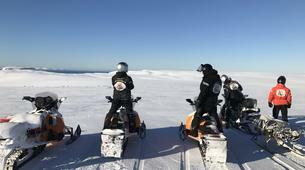 Facilities for outdoor wilderness adventures all year around in a relaxing atmosphere with a breathtaking panoramic view of the village of Mehamn and the Barents Sea. You'll arrive at Mehamn Airport (MEH) and welcomed by a guide from Nordic Safari AS. Then you'll be transferred to Adventure Camp Mehamn, where you'll check in at Fisherman’s cottages built on the sea water. You'll savour a light meal in the restaurant, after which you'll be given information on the next day’s program. Today you're going to explore the Nordkyn peninsula trails after your hearty Norwegian breakfast. You'll drive along the trails and go sightseeing in Sletnes lighthouse, enjoying the panoramas over the Barents sea. You'll then take a coffee break in the lighthouse, after which you'll drive along the crystal blue seawater of Risfjord. Then you'll experience high speed driving along Lake Koifjord. You'll climb up the steep mountain sides of Sandy Mountain, taking the time to appreciate the fantastic views over the fjord districts. You'll then descend the breath taking hills to Skjånes, a small fishing village that is known for its exotic and peaceful atmosphere. You'll drive through the village situated by the calm, crystal clear fjord and eat a delicious lunch at Skjånes, after which you'll climb up the hills again, occasionally stopping to discover the rough exciting hilly canyons of the fjord district of Hopsfjorden. You'll then drive through Iversfjord, Kobbvika and the Guttorm river valley, before making you way back over the high speed planes of Nordkyn peninsula. Finally you'll go down the Mehamn valley and back to the “Adventure Camp”. On the way you'll refuel at the gas station of Mehamn. In the evening you'll be able to relax in the sauna and bath in the Arctic Ocean before sitting down for a traditional seafood dinner. Today you’re going to explore Nordkyn Peninsula West. You’re going to drive along the west side of the peninsula, down the Vika Valley Canyon to Laksefjord, to the virgin Nordmanseth Bay, where you’ll be exposed to spectacular panoramas. You’ll drive down to Kjøllefjord fishing village, walking the streets, before stopping for lunch at a local restaurant. After lunch you’ll head for the Barents Sea, again driving the high speed terrain out to the abandoned fishing village Skjøtningberg. In the case of rough weather you could stop off at Dyfjord fishing village instead. Enjoy a coffee break at the sandy beach, watching the waves of the Barents Sea and then head along the valleys and canyon Oksevåg up to the high lands again, before returning to Mehamn. 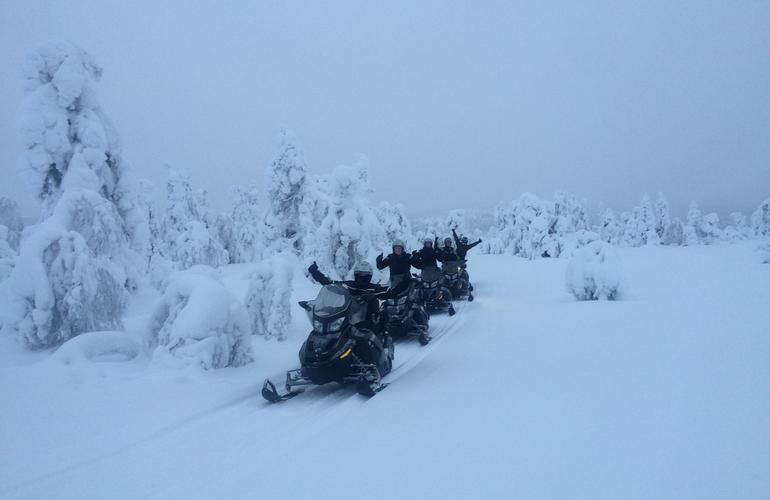 You’ll return by snowmobile to Adventure Camp Mehamn, along the high mountain tracks. 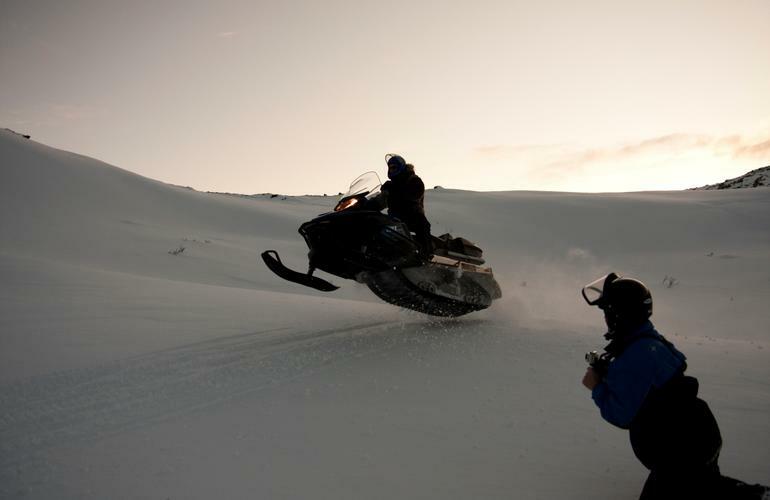 6:00pm: Drive the snowmobiles on board the coast express ship, Hurtigruten. Cruise for two hours, passing Nordkyn, the northernmost point on the European mainland 71.08.N - Northern latitude! 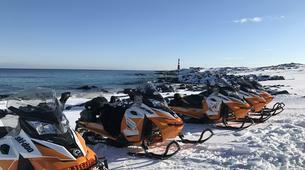 8:00pm: Arrive back at Mehamn harbour, drive the snowmobiles off the ship and return to the Adventure Camp. Like the previous evening, you'll be able to relax in the sauna and bath in the Arctic Ocean before sitting down for a traditional dinner. How to get to Mehamn? Today you're going to explore the Nordkyn peninsula trails after your hearty Norwegian breakfast. You'll drive along the trails and go sightseeing in Sletnes lighthouse, enjoying the panoramas over the Barents sea. You'll then take a coffee break in the lighthouse, after which you'll drive along the crystal blue seawater of Risfjord. Then you'll experience high speed driving along Lake Koifjord. You'll climb up the steep mountain sides of Sandy Mountain, taking the time to appreciate the fantastic views over the fjord districts. You'll then descend the breath taking hills to Skjånes, a small fishing village that is known for its exotic and peaceful atmosphere. You'll drive through the village situated by the calm, crystal clear fjord and eat a delicious lunch at Skjånes, after which you'll climb up the hills again, occasionally stopping to discover the rough exciting hilly canyons of the fjord district of Hopsfjorden. You'll then drive through Iversfjord, Kobbvika and the Guttorm river valley, before making you way back over the high speed planes of Nordkyn peninsula. Finally you'll go down the Mehamn valley and back to the “Adventure Camp”. On the way you'll refuel at the gas station of Mehamn. In the evening you'll be able to relax in the sauna and bath in the Arctic Ocean before sitting down for a traditional seafood dinner. You'll rest in the cottages, before boarding the Hurtigruten ship. 00.30: Drive the snowmobiles to the Hurtigruten Pier. Drive the snowmobiles on board the car deck. 01.00: You'll check in at the reception and then sleep well in comfortable cabins on board. 06.00: The ship will arrive at Honningsvåg harbour, the city under North Cape, where you’ll have breakfast at local hotel. 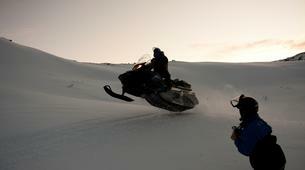 You’ll then load the snowmobiles up on trailers and transfer them to snowmobile track, which starts outside the city. 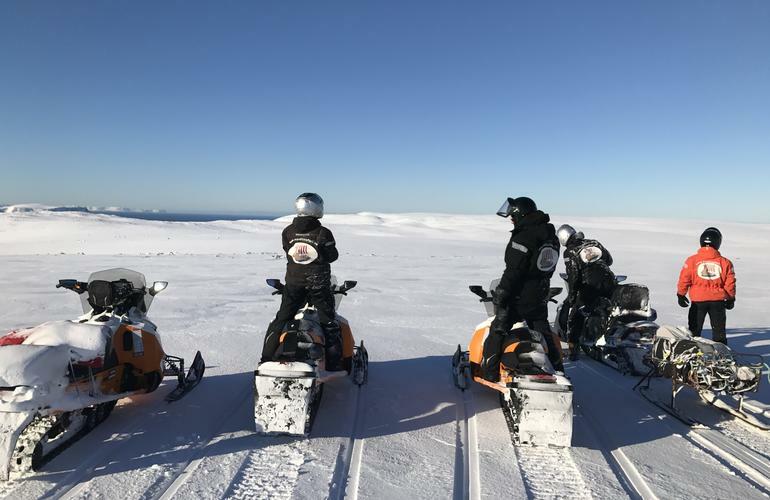 08.00: Drive up the valleys to start out on the mountain cliff towards the North Cape and enjoy great panoramas as you drive up the narrow mountain cliff. This is an area with extreme weather conditions, so all necessary precautions will be taken – safety first. 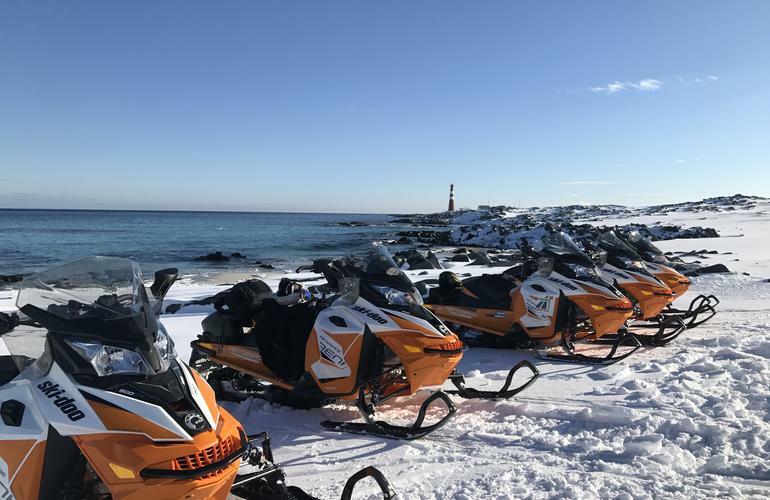 10.00: Once you’ve arrived at the Cape safe and sound, you’ll line up the snowmobiles at the edge of the 280 metre high cliff and make a good loooong Champagne cheerio! Yiiiihaaa! You’ve made it! You’ll visit the North Cape hall and after taking 1000 pictures of the team and the nature, you’ll enjoy coffee and cakes inside. You can also go souvenir shopping before descending down towards the city Honningsvåg again. 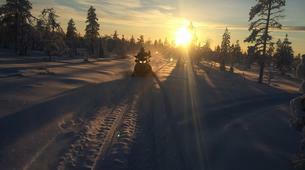 Then you’ll drive the snowmobiles on board the Hurtigruten ship again. 17.30: Arrival at Kjøllefjord Harbour - drive the snowmobiles through the village and cross the mountains back to Adventure Camp Mehamn. In the evening you'll be able to relax in the sauna and bath in the Arctic Ocean before sitting down for a traditional dinner. 06.15: Departure by plane from Mehamn airport. Thank you for the expedition and welcome back again!